Patrons shop in the clothing closet portion of the ministry. JENKS—A little more than a year ago, an elementary school in the Jenks school district contacted First Oklahoma Bank in the community, asking if they could help find clothes for children and their families that were in need. The bank owners then reached out to Jenks, First; Tulsa, South Tulsa, First and Yale Cleaners. 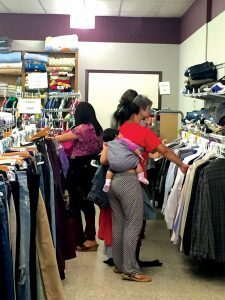 Together, the churches and businesses sponsored Jenks CarePoint, a Christian-based ministry that primarily provides clothing and shoes to families in need, free of charge. Disposable diapers and other family items are also distributed through CarePoint. “Between those four entities, they partnered up, began to plan, found a site to house the ministry and developed from there. We have a board of directors and have been incredibly blessed with the support of the community and of the churches. The donations are constant,” said Kara Lee, director of CarePoint. “Our mission is to serve the students and families of Jenks Public Schools and the community by providing resources and programs to meet physical, social, emotional and spiritual needs as we share the love and hope that is found in Christ,” Lee said. According to Lee, the community that surrounds CarePoint is heavily populated with Burmese refugees. Lee said they fled their home country due to the violent war and persecution of their Christian faith. “I was stunned to learn of this need in Jenks, a community with a lot of wealth. But the need is there, and we’re going to fulfill it,” Lee said. In addition to offering clothing to these families, CarePoint offers sewing classes and English as a Second Language (ESL) classes. The ESL classes and sewing classes are taught to help equip individuals with knowledge and skills to improve their social, financial, emotional and spiritual well-being. Women participate in the sewing class offered at Carepoint. They are able to purchase a sewing machine at the end of the semester. Currently, more than 40 people are taking ESL and sewing classes at CarePoint. After they finish a semester of classes, they can purchase a sewing machine at a reduced cost to them. CarePoint has been open for 10 weeks. In that time, they have distributed clothing to an estimated 1,200 people. Lee says there are future plans to develop additional ministries and services as other needs that exist within the community are determined. Other ways CarePoint has been able to serve the community are through leaders in the churches reaching out to young mothers and stepping in to help them understand motherhood, the culture and community. “They are new mothers and don’t have their mom to be around and help them. So we take them on outings and help them learn to navigate in our country, where everything is new to them,” Lee said. Jenks CarePoint is open to the public Monday through Thursday, 9 a.m.-1 p.m. and 9-11 a.m. every third Saturday. It is located at 2914 East 91st Street. CarePoint accepts all sizes of men’s and women’s clothing, children’s clothing, new underwear and socks, shoes, coats, disposable diapers, blankets, sheets and towels. For more information, visit www.JenksCarepoint.org.